This is a still image of Bayard Rustin (Black male at microphone) and Bronx CORE chairman Herb Callender (Black male right, dark overcoat). The photo speaks again to the complicated relationship between Rustin and CORE. He is not on staff or a member of any chapter. At this point, according to Norm and Velma Hill, if he was a member of any group it would have been the Southern Christian Leadership Conference (SCLC). However, he is enough of a presence in CORE that James Farmer believed Rustin was trying to instigate a coup to oust him as the head of CORE. Rustin worked close with CORE in New York City (where he lived) throughout the first half of the 1960’s. They worked together on many demonstrations against the Board of Education including the 1964 Citywide School Boycott. Rustin was also a lead organizer for CORE’s 1964 World’s Fair demonstration. His right hand people from the March on Washington, Norm and Velma Hill, Tom Kahn and Rachelle Horowitz, were also leaders in CORE both nationally and locally. Other members of his MOW staff, such as Penn Kimble and Paul and Sandy Feldman, were founding members of East River CORE. 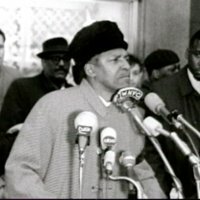 “photo of Bayard Rustin and Herb Callender, Bronx CORE chairman,” corenyc.org, accessed April 21, 2019, http://www.corenyc.org/omeka/items/show/196.